GO MOMS was originally designed to bring the latest effective treatments for obstetrical emergencies from the developed world to the developing world. Using lectures, videos and simulations in the native language, this teaching program has been proven to be successful. However during the implementation of GO MOMS, new research conducted in the USA found that we have a higher maternal mortality rate than previously thought. Although not all the conditions causing harm are the same between developed and developing countries many are, such as hemorrhage, hypertensive disease and shoulder dystocia. With this in mind we are developing the GO MOMS-USA educational program for hospitals here in the USA. Our goal is to provide the needed educational program to help decrease the maternal mortality and morbidity rate we are experiencing in the USA. September 2018 GO MOMS launched the GO MOMS-USA program. We began in Mississippi where we were invited by the Mississippi Maternal Perinatal Quality Collaboration (MMPQC) and Blue Cross & Blue Shield of Mississippi (BCBSMS). Prior to our GO MOMS visit we conducted a hospital assessment survey. This information allows us to shape our teaching to a specific site. We received responses from 7 of the participating hospitals. Results showed that we were teaching to a large clinical range of hospitals. The course consisted of a 4 hour session repeated in the AM and PM for different groups of providers. 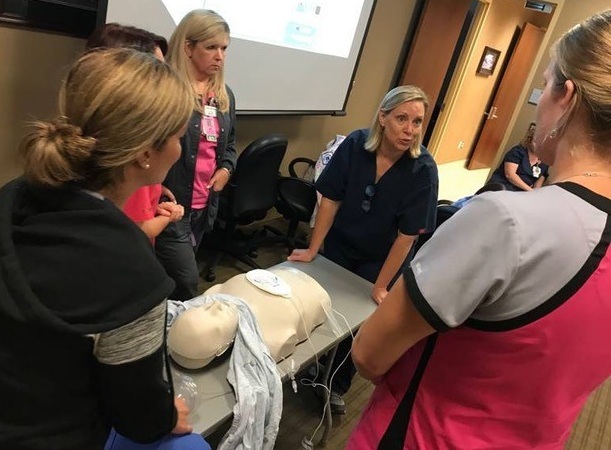 The following day we provided modeling and guidance for the simulation team at Forrest General Hospital in Hattiesburg to perform a postpartum hemorrhage training in their simulation center. The GO MOMS team’s is grateful to our hosts and the participants in the Mississippi program for enhancing our understanding of the educational needs in the USA, allowing us to adjust our curriculum.